Today certainly wasn’t a good day for fans of The Unit. CBS cancelled the show after four seasons on the air. For producers of the series however, today’s dark cloud also had a silver lining. Though there won’t be any new episodes featuring Dennis Haysbert, Regina Taylor, Robert Patrick, Scott Foley and company, the show will return to the airwaves next year. The show’s studio, 20th Century TV, announced today that the military drama has been sold in syndication. According to the Hollywood Reporter, The Unit has been cleared in 56% of the country, including Fox and CBS stations. It’s sold in all 15 of the top markets, including New York, Los Angeles, Chicago, Philadelphia, and Dallas. Because only 69 episodes have been produced, the stations are likely to run episodes only once or twice a week. While several series have been saved recently because of potential syndication profits, there’s seemingly no interest in continuing The Unit. This likely stems from the fact that hour-long dramas aren’t as popular in syndication as half-hour sitcoms. The series launches into syndication beginning in the Fall of 2010. 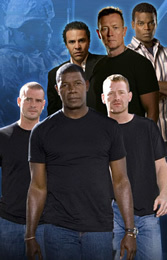 The Unit: CBS Cancels Dennis Haysbert Series, No Season Five! TV News Briefs: The Unit, Old Christine, The Mole, Stargate: SG-1 and Quincy, M.E. it’s so good, there are so many people listening to this show I can not believe there is not another season. I want a season 5 of the Unit!! !